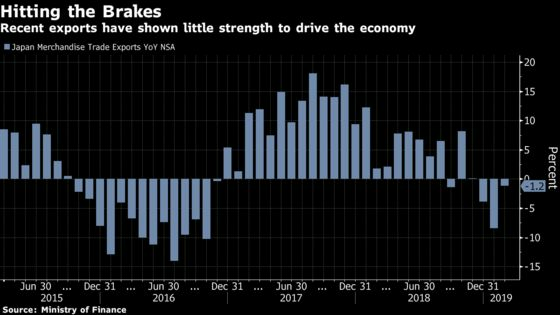 Japan’s exports fell for a third straight month in February, as a global economic slowdown and waning technology cycle take a toll. Shipments abroad fell 1.2 percent by value from a year earlier, according to the finance ministry. Economists had forecast a 0.6 percent drop, following an 8.4 percent slide in January, the biggest slump since 2016. Autos were the biggest drag, while semi-conductor related goods also weighed heavily. A 14 percent fall in exports to South Korea, a key provider of semiconductors to the global tech supply chain, underscores the impact of the slowing tech cycle. Japan’s shipments of chip-making equipment to Korea plunged 60 percent. The Bank of Japan last week cut its assessment of overseas economies, exports and factory output. Signs of weakness in the economy put Prime Minister Shinzo Abe in a tough position as he plans to raise the nation’s sales tax later this year. Some economists, including a former economy minister, have called for another postponement. “The economy is likely to stay in a soft patch for the first half of this year and then it will probably pick up after China’s economy and the IT sector hit bottom,” said Norio Miyagawa, senior economist at Mizuho Securities Co.
"Looking ahead, the signals aren’t good. The export orders sub-index of the Nikkei Japan Manufacturing PMI remained below 50 for a third consecutive month in February. ... In the immediate future, we’re watching to see how U.S.-China trade talks play out." Imports fell 6.7 percent in February, compared with a 6.4 percent drop predicted by economists. Exports rebounded 6.7 percent from January. The trade balance was a surplus 339 billion yen in February, versus the median forecast for a 305.1 billion yen surplus. Exports to China increased 5.5 percent in February, while shipments to U.S. climbed 2 percent and sales to Europe advanced 2.5 percent. Looking at January and February together, exports to China fell 6.3 percent.